A place where you can win the NCAA Lacrosse Championship, the Mann Cup and the World Lacrosse Championship all in the same day ! No other set of drills will improve your game faster or more efficiently than playing "wall ball". All you need is your stick, a ball and a brick wall (with no windows in sight!). For the younger players, the "soccer walls" found at most local schools will do, although they may be too short for older players. Find a wall and improve your game! 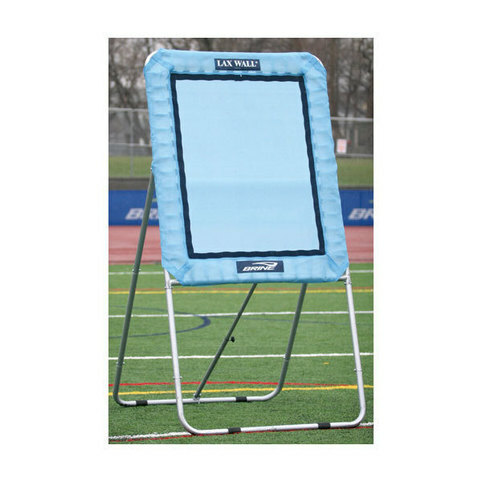 Stand about 10-15’ from the wall and throw and catch without cradling. The idea is to get the ball out of your stick quickly once you catch it. Use both hands! Stand about 20-30’ from the wall, throw and catch it after one bounce. Move in and out as you vary the speed. Find a long section of wall and run parallel to the wall while throwing and catching. This teaches you to throw on the run and catch on the run. Also, most of the bounces off the wall will not be perfect “passes”, just like the real game. So practice catching at all the weird angles this drill can produce! Tape up a goal on the wall or simply pick an off-color brick. Practice aiming for that spot. Do this drill standing still AND on the run – run to either side as well as straight at the wall. Always try to catch or scoop the ball on the rebound! Similar to the Quick Stick drill mentioned above, but only use one hand on the stick. Practice catching and throwing “cross handed”, with your dominant hand crossed over your body. At any distance and either on the fly or on the bounce, throw the ball and immediately change stick hands for the catch. The Wall is a great place to practice all the “tricks” you can think of – behind the back, reverse behind the back, underhand, fakes – try it all!